Since blind rivets are meant to be permanent fixtures, they are not made to be removed, but there might come a time when an individual would like to have this done, and when that happens, they should know how to accomplish the feat. It is important to keep in mind, however, that the right tools need to be used for the job, and careful attention needs to be paid to the difference between round headed and countersunk rivets; this is because they will be removed in slightly different ways. In order to begin the process of removing the blind rivets, the head of the item needs to be examined first; if the tool has a rounded head, a grinding machine can be used to slowly wear down this facet of the device. There are those who choose not to grind down the head before they start the next step of the process, but this might end up making the task a lot more difficult in the long run. In the event that the item is a countersunk device, grinding is not necessary since the head will not protrude in the same manner; in fact, this task could end up damaging the materials that are attached because the grinder will eat it these facets instead of the rivet. Once the head has been removed from the rivet, individuals can then proceed onto drilling into the shank of the item. One of the most imperative facets of this step is to ensure that the drill bit is the right size; if it is too large, it could end up damaging the material from which the rivet is supposed to be removed, and this could end up forcing the previous nut to be replaced by a much larger one. Drilling directly into the center is important; if any deviation is made to this direction, the following rivet might be impossible to install. After the majority of the work has been done, the remaining facets of the rivet should be easier to remove with your hands, and it is imperative that each part of the device is carefully removed so that no facet remains behind. 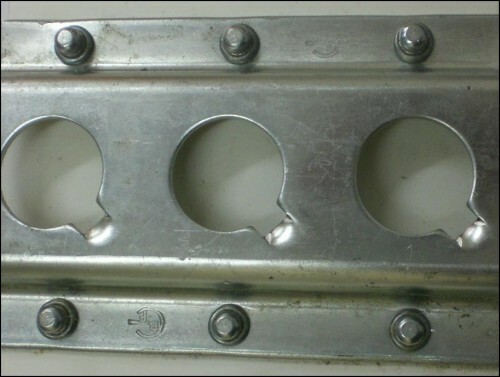 While rivets might have been designed to be permanent, it is common for individuals to make mistakes during the construction of a project, or to simply want to exchange an old, worn out nut with one that is new and sturdy; by getting to know how these items are removed, replacing them becomes a breeze. We are extremely proud of our new V series of rivet guns. These rivet guns are a prime example of how advances in technology help give you the best value for your money. The V series were designed to be extremely comfortable and simple to use. Both the BP-3V and BP-4V fit easily in the hand, give low shock, and weigh just 3.2lbs and 3.6lbs respectively. They are also extremely small in size, making it easy to complete work in even the tiniest of spaces. However, no sacrifices on power were made. The BP-3V features 2100lbs of pulling force, while the BP-4V offers a massive 3500lbs of force. Power on this level, from tools so lightweight, cannot be found anywhere else in the industry. The BP-3V has the blind rivet setting capacities of 1/8”, 5/32” and 3/16” in all alloys. The BP-4V’s capacities are 1/8”, 5/32”, 3/16”, as well with the added 1/4” capacity. The BP-3V and BP-4V both feature a thumb-operated control button, to help keep the rivet in place. Each gun also comes with an oil applicator and services wrenches. For optimal use, we recommend keeping an operating air pressure between 80-95 psi. If you’d like to see the full specifications for the BP-3V, click HERE. For the BP-4V, click HERE. Solar farms are usually assembled in vary large flat outside areas. Solar is becoming more widely adopted too. Solar farms are assembled right on site. To set up a solar farm, a cement slab is laid and the brackets are put together right on location. The problem is that, traditionally, they have been assembled with nuts and bolts. Why? Because the concern of rivets pulling through the material is of major concern. The problem with a nut and bolt are many. For example, nuts and bolts require two pieces(naturally). Bolts and nuts are heavy and require tons of manual labor and time to install. Many world-class solar installation companies are discovering the “Orlock Rivet” fastening solution. Orlock, first and foremost, has a back-side flange that allows it to grip and hold the mating material together, without the threat of pulling through the material. Orlock is also amazingly easy and quick to install. Orlock is of coarse is a one piece blind fastener, so inventories are light and requires less total pieces of material. All of these reasons can help make Solar a more useful energy alternative for our planet. Orlock is helping to protect our planet… One rivet at a time.